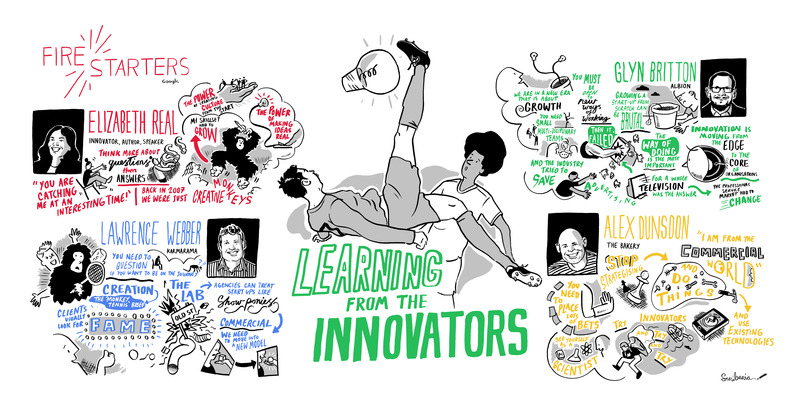 The great and the good of UK planning (or at least those who were not in Cannes) came together last week for the latest Google Firestarters - this one on the theme of innovation. It's a well-discussed theme of-course, but I wanted to create an event that featured people who have actually been at the coal face of innovation with clients and think about the implications of how innovation is changing, and what this could mean for the role of agencies. I've also been doing a fascinating piece of research on behalf of the AAR Group over the past few months into the innovation partnership landscape (more on that soon) which has really brought into sharp focus just how rapidly the space is moving. We had four amazing speakers, each with a different but complementary perspective. First up, Elizabeth Real gave a captivating personal account of her journey at the leading edge of innovation (she has spent 11 years at ?WhatIf!, latterly as the European CEO). She was originally advertising and planning trained (at McCanns and Y & R) and she talked a lot about how classic planning skills had informed her approach to innovation and enabled the shift, but also about the frustration of working in an ad agency on briefs for advertising that were ultimately about shining a light on a bad product. The frustration of being asked to work on an ad solution when the real problem that the client needed to solve was how to innovate their product. And she spoke of how innovation in client organisations has fundamentally changed from being an episodic focus, primarily on ideation, to one which is far more about creating an innovation engine, and culture, within the organisation. It was really interesting to hear her perspective on how traditional planning skills (like reframing problems and challenges from a customer perspective - she gave a lovely example from a pet insurance business she'd worked with where executives got out of the office and interviewed customers in a dog park) can be combined with newer maker skills (like rapid prototyping) to create a sustainable innovation culture, one that can support a 'founder's mindset' and can build the business of tomorrow. Lawrence Webber, Managing Partner Innovation at Karmarama followed up with an excellent look at the state of agency innovation, positioning his talk around an evolutionary scale that begins with 'shiny innovation baubles' - the kind of PR-focused innovation around the edges that is more about tactical creativity than real business-changing ideas. This kind of innovation may not transform companies but a continuous flow of inspiration can create better agency work and less traditional thinking, but we need to remember what it is - the metrics are PR and awards and little else. The next key stage is curation, represented often by the creation of an innovation 'lab'. Whilst there have been some notable examples this approach, he argued, it is perhaps slowly dying out as businesses need to find better ways to connect with entrepreneurial/startup thinking and propositions. Experimentation and Open Innovation are brilliant things, he said, but innovation shouldn't operate as a stand-alone P & L within an agency, and experimentation and technology should be right at the heart, with startups or scaleups as sustainable partners not performing monkeys. The third stage is where agencies are asked to solve business, not marketing problems - the realm where a big creative idea can be a focus for business change. The challenge with this is that the kinds of questions that clients ask in this scenario means that (creative) agencies can't be meaningful innovation partners without themselves changing. Being a part of Accenture Interactive gives Karmarama a uniquely interesting perspective on how the varied partners and capabilities involved in a holistic approach to innovation can combine for client benefit. KBS Albion was name-checked by Lawrence as one of the (relatively few) agencies that had successfully built a new proposition around helping companies to apply innovation to build entirely new businesses or transform existing ones (or both), and we were fortunate to have CSO Glyn Britton follow with an exceptional talk on how innovation is maturing and also how the professional services market is now being disrupted. Like Elizabeth, Glyn begun by talking about how corporate innovation had moved from the edges to the centre, a shift which is exposing the failure of traditional consultancies and agencies to move with clients and enabling a new breed of service design and innovation firm to partner with corporates and build businesses and ways of working that can transform. He used ING as an example (I've written up a case study of how ING have undergone an agile transformation here) of a large organisation that has changed in fundamental ways not only in how it is structured, but in working practices, and how it has progressed from simply experimenting with new technology to do old things slightly differently, to creating useful, strategic new propositions, products and services that can forge new kinds of relationships with new kinds of customers. A good example is ING's fantastic new money manager Yolt. Ultimately however, continuous innovation requires the whole organisation to transform in order to keep pace with rapidly changing customer needs and expectation. This in turn is impacting what clients need from their partners. If agencies and consultancies are effectively part of the same advisory professional services market, they have arguably both suffered through failure to keep pace with changing client needs and focusing too much on their own profits rather than the shifting requirements of their clients. This has opened up a gap of opportunity. Where professional services used to be outcomes led (marketing led growth, or profitability - he made the point how the best agencies had always created ideas that could drive and shape whole businesses - ideas such as 'The World’s Favourite Airline' for British Airways, or 'We Try Harder' for Avis), they became overly focused on TV advertising (in the case of agencies) or technology implementation (in the case of consultancies), and so became increasingly outputs focused. Failure to move on from traditional levers for growth and to recognise the need to improve products and services in response to changing customer needs has meant that the rest of the enterprise has taken responsibility for some of the areas that marketing could always do (insight, strategy, distribution, customer experience) leading legacy consultancies to connect up outputs. 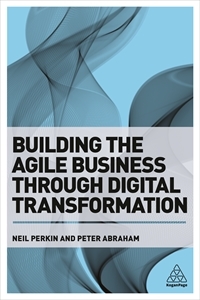 The challenge with this is that this horizontal proposition is not agile enough to be a true collaborator in a rapidly shifting world, opening up a gap which has been filled by smaller, nimbler transformation partners and consultancies (like Adaptive Lab, Made by Many, KBS Albion) which are going back to being outcomes focused, alongside disruptive propositions like talent networks and outcomes focused agencies. Glyn went on to describe how they work in agile ways with their clients (small teams, co-located, focused on solving customer problems) and how this is disrupting the traditional large consultancy model. It was a truly fascinating and insightful talk. Happily Glyn has done a more comprehensive write up of it which you can read here. Finally we had Alex Dunsdon, co-founder of The Bakery, which brings together a global network of entrepreneurs with some of the world's biggest businesses. Alex talked a lot about over-strategising, and the challenges of creating genuinely disruptive ideas in a large corporate ('in five years I've never heard a startup use the word 'innovation', and yet it's everywhere in big companies') and instead made the case for making lots of small bets. The high failure rate of truly different ideas mean greater risk appetite which is difficult in the context of how most corporates approach risk, and the large corporate innovation graveyards that exist in most big companies. An example of the high failure rate can be seen in venture capital returns which typically follows a power law curve (in other words a very small proportion of their investments will pay back big). He showed the process that they run at The Bakery which can enable companies to make multiple bets whilst also taking a sensible approach to 'casting' (matching entrepreneurs to business problems) but it was this need for continuous experimentation that was the central theme. Paraphrasing Nicholas Taleb, many of the greatest discoveries in history including penicillin and the laser were discovered by accident, and it's only through multiple bets that we can create the opportunity to win big. The panel debate afterwards continued this rich thread with plenty of discussion around the role of agencies with innovation, and how clients choose which partner to go to to solve different problems. One of the attendees at Firestarters said it was the best event on Innovation that he'd ever been to which (given how many events there are on the topic) is no small complement, and says a lot I think about the quality of the talks on the night. So my thanks to our brilliant speakers, to Google as always for hosting, and to those who came along. Thanks also to Sciberia who did their usual brilliant job of scribing the talks - you can see the full visual in all its glory here. We have some big plans for our next planning Firestarters in the Autumn so do look out for that - more details will be announced in due course on my newsletter.